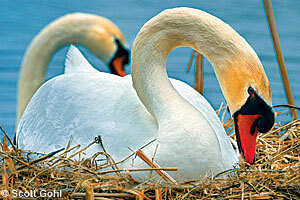 Species and Origin: Mute swans are a large species of white waterfowl. 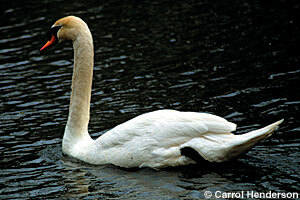 Adult mute swans have all white plumage, vibrant orange bills, and black knobs above the bill. Young birds have grayish bills. Native swans have entirely black bills. Mute swans are native to Europe and Asia. They were brought to the United States from the mid-1800s through the early 1900s. Impacts: Mute swans are very aggressive even toward people. They chase water birds including loons, and can keep those birds from nesting. One bird can uproot about 20 pounds of submersed aquatic vegetation daily, reducing important native aquatic plants. Status: Several states east of Minnesota have populations ranging from hundreds to several thousand birds. The population in the Great Lakes states is increasing about 10 to 20 percent annually. Where to look: They live on lakes and wetlands. Regulatory classification (agency): Mute swans are a regulated invasive species, which means introduction into the wild is prohibited (DNR). Possession of captive birds requires a state game farm license and fencing to contain them. Means of spread: Mute swans have escaped from captivity or were intentionally released on ponds for ornamental purposes. They have sometimes been used as ineffective and illegal means to deter geese from an area. Don't purchase and release mute swans.